Namibia's desert-adapted lions. Photo: Susan Portnoy, The Insatiable Traveler. One of many reasons to visit Namibia is its otherworldly Skeleton Coast, where, if you’re lucky, you’ll see the elusive desert-adapted lions that are unique to this part of the world. I knew little about the cats when I arrived at Hoanib Skeleton Coast Camp on a recent safari, but I left fascinated by their story. Here are five reasons why these unusual lions should be on everyone’s must-see list. It’s hard to imagine anything surviving on the Skeleton Coast, the world’s oldest desert, spanning thousands of miles along the western border of Namibia. 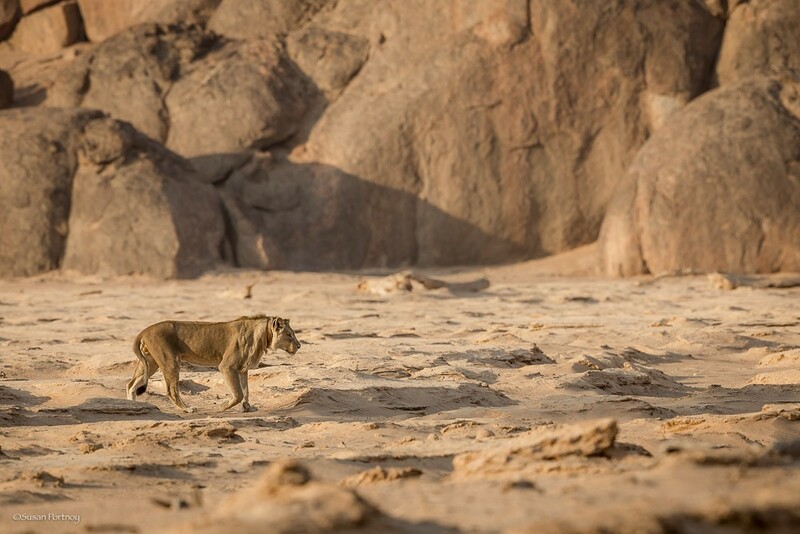 Between the lack of food and water, sand storms, blinding fog, and drastic changes in temperature from bitter cold to blazing hot, often within the same day, it’s one of the most inhospitable environments on the planet—and the last place I expected to see a pride of lions. Indigenous to the region, desert-adapted lions are the same species as their counterparts elsewhere in Africa, but over countless generations have evolved to endure what the others cannot. To withstand the arid wasteland, the lions can go without water, deriving what they need from the blood of their prey. Their coats are slightly heavier to protect them from the cold, and they can travel long-distances in search of food. Photo: Susan Portnoy, The Insatiable Traveler. The number-one threat to the survival of desert lions is human-lion conflict—namely, villagers who shoot or kill the big cats to protect their livestock. In the early ‘80s, multiple adult lions were shot, and for some time they were thought to be extinct. But the lions prevailed and were later discovered in the mountains to the east. Over the years the population grew, and today there are approximately 150 lions in the region. With such a small number, however, the gene pool can be easily compromised. The loss of only a few breeding adults could potentially tip the scales toward disaster. 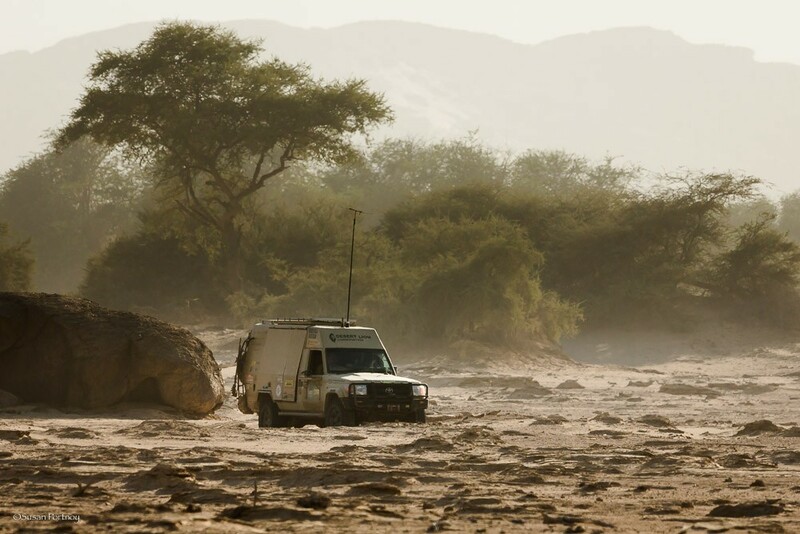 Dr. Philip “Flip” Stander spends four months at a time alone in the desert in his research vehicle, studying Namibia’s desert lions. Photo: Susan Portnoy, The Insatiable Traveler. Stander believes tourism plays a crucial role in the lions’ future. The cats are a big draw for Namibia and, the more dollars associated with them, the more reason everyone has to keep them alive. The problem is that many of the people in the villages who are forced to live with the lions aren’t seeing the benefits of bearing the burden. Stander hopes that by educating travelers and working with the government and villagers on the ground, he can help bridge the gap. Two years ago tragedy struck: One of the few remaining adult male lions was shot. The fate of the population, once again, seemed doomed. But Mother Nature stepped in. At about the same time, three females from the Floodplain pride—a mother and her two daughters—gave birth to five male cubs, an almost unheard-of scenario in the wild. In one fell swoop, a brighter future seemed possible, as long as the lions could stay alive and breed. Coined the Five Musketeers, they’re a lucky bunch. In the wild, 80% of cubs die before the age of two, and yet all of them have successfully reached that milestone. Soon they will permanently separate from their mothers in search of females with whom they can mate. The Musketeers are collared and monitored very closely by Stander. The information he receives via satellite helps him to track their movements and study their behaviors. He also uses the collars to provide Hoanib with their location so that guests can see them if they’re in range. In return, the camp’s parent company, Wilderness Safaris, helps Stander with funding and logistics. Without Standers’ intel, the lions’ territory is so vast and the terrain so difficult, they would be almost impossible to find. 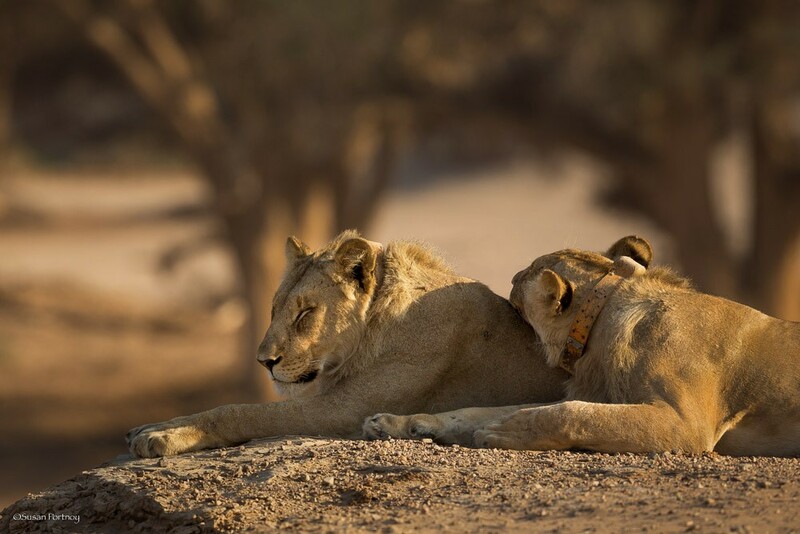 Namibia’s desert-adapted lions; the young ones are collared and monitored by the Desert Lion Conservation Project. Photo: Susan Portnoy, The Insatiable Traveler. The Five Musketeers are stars in Namibia; soon they will be celebs around the world. 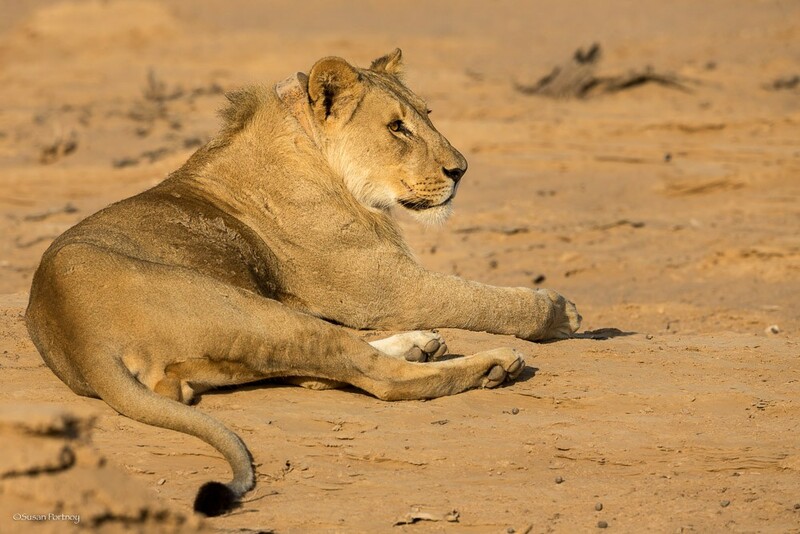 Will and Leanne Steenkamp of Into Nature Productions spent two years battling the desert and working with Stander to film the lions from young cubs to current day. The film, called The Vanishing Kings: Lions of the Namib, looks at their herculean efforts to survive the Skeleton Coast and the lives of their matriarch (of sorts), the majestic Queen. The documentary will air on the Smithsonian channel later this summer. Disclosure: Susan was a guest of Hoanib Skeleton Coast Camp during her visit. While discussion of her journey was expected on her own blog, The Insatiable Traveler, how and what she chose to write was completely at her discretion. Be a smarter traveler: Use Wendy’s WOW List to plan your next trip. You can also follow her on Facebook and Twitter @wendyperrin, and sign up for her weekly newsletter to stay in the know. Read more about Susan Portnoy’s trip to Namibia at her own site, The Insatiable Traveler, and follow her at facebook.com/Insatiabletraveler and @susanportnoy. 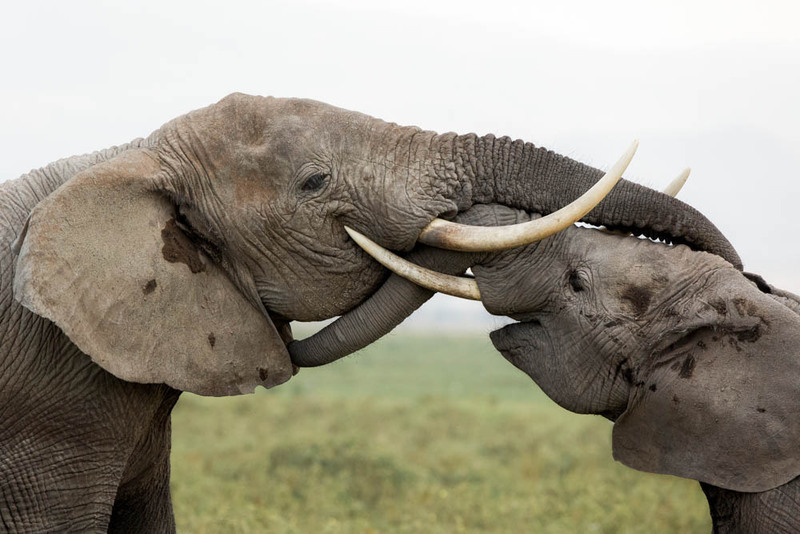 To increase your chances of taking wildlife photos you’ll love, look for these behavioral clues from safari animals. Travel experts share their tips for the perfect African safari packing list.